Last time, I wrote a bit about settlements in the wilderness of DARK SUN. I mentioned briefly the presence of the major city-states, so now's a great time to talk a little bit more about adventuring there! Since the world of Athas is a devastated nightmare of diminished resources, survival is a difficult proposition. Naturally, this prompts people to band together anywhere that they have a decent chance of avoiding the monsters of the wastes. This, though, places people at the mercy of different kinds of monsters . . .
My friends John Wick and Brandon Miller are very fond of running city-based adventures. The trick to these kinds of adventures is that the heroes aren't going forth to some place that they'll sack and loot, to return wealthy and never re-visit that distant dungeon or wilderness again. Instead, they're having adventures in the place where they live. Anyone they cross is going to be someone they'll see again. Any household they loot is a household that will be on the look out for them. This is a bit of a departure from the adventuring style of simply killing all opposition and taking all of the treasure -- oftentimes, just killing people is going to cause more problems than it fixes. 1. Everything that is worth having in the city is controlled by someone else, and you have to either fight them from a weak position or work with them to gain access to the things you want or need. 2. You can't screw things up too much, or else the law will come down on you. 3. Your ability to get ahead will depend on figuring out how everyone else in the city works with, for, or against everyone else. Note the arrows connecting the various power groups. These let you describe how those groups see each other. This graph, obviously, centers on the sorcerer-king and his relationship to many of the other power groups in the city. You can make a more detailed graph if you connect those groups to each other (how to the templars feel about the Veiled Alliance? ), or you can make separate graphs for each group, showing how that group interacts with everyone else as the center of its own social world. This graph is useful because it gives you an immediate idea of the tensions that exist between the various power groups. Since the players' characters are outsiders, they'll be able to squeeze their living out of exploiting those tensions -- or find themselves crushed between the groups! 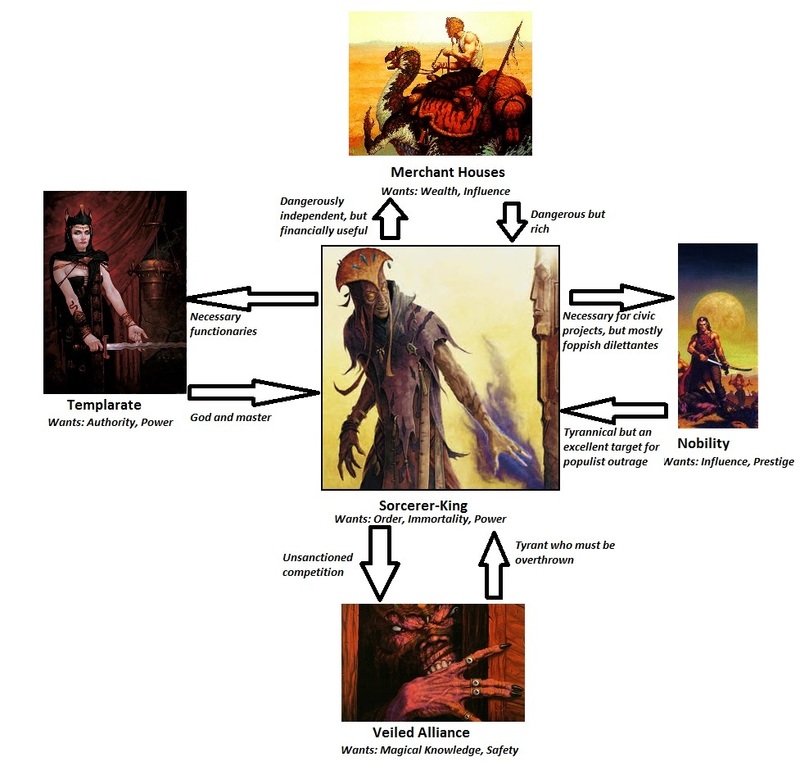 As an example, the relationship between the Veiled Alliance and the sorcerer-king is a very unbalanced one. To the Veiled Alliance, the sorcerer-king must be overthrown at almost any cost. To the sorcerer-king, the Veiled Alliance represents a minor annoyance, and he would even be willing to offer amnesty to a few of them if they promised to serve him (assuming they caught him on a good day). This unequal relationship means that the Veiled Alliance is likely to be a patron to characters who oppose the sorcerer-king, but the sorcerer-king is unlikely to take a personal note of their activities unless they actually become threatening somehow. (The relationship between the templars and the Veiled Alliance is a different story). Remember last time when I mentioned the films Yojimbo and A Fistful of Dollars? Canny players will put themselves into the middle of these situations and exploit the tensions between the power groups in order to make money. As outsiders to the power structure, they can try to walk a fine line between the different groups. One day they might hire themselves out to the templarate in order to help track down a member of the Veiled Alliance, or serve as muscle to keep one of the merchant houses in line. The next day they could be running a scam for a noble house in order to deflect blame away from one house and toward another. Where the adventurers get caught in the gears is when they don't have complete information. The diagram above, for instance, is a fairly typical example of how the various power groups function, but individuals in those groups might have their own motives. A group that expects templars to deal harshly with a cheating merchant family might be in for a shock if it's suddenly revealed that the templar is originally a younger scion of the family, or has been on the take from the family's payroll for years! These sudden reversals force the players to think on their feet and find a way to keep from falling into the meat grinder. Adventures in the city, then, are less about killing things and taking loot, and more about navigating the treacherous silt estuaries of power and relationship dynamics. Every action potentially earns the characters enmity from someone, and the players will have to try to play these enemies off against each other -- throwing blame on noble houses for excessive taxes that cause unrest with the merchants; blaming the merchants for cheating the templars with shoddy goods so that they could pay the taxes; blaming the templars for making excessive demands on the market for weapons in order to hunt down the Veiled Alliance; blaming the Alliance for attacking the noble houses and causing unrest that demanded a forceful response. Of course, the minion you threw under the wagon yesterday could become a powerful foe tomorrow. Redirect blame at a low-ranking templar who oversees the slop cart, because that nobody is never getting a promotion? Tomorrow the templar has a mysterious patron, and is determined to make you pay for those earlier indignities. Threw the blame onto some slaves for thefts and destruction inside of a noble house's compound? Uh-oh, the slaves revolted and several of them escaped, along with a skilled gladiator who's been training them to fight -- and they're coming to make you pay! Of course, eventually your city adventures come to an end because the city becomes too dangerous a place for the players to stay in. Once you've made too many enemies, the templars are looking for you, nobody will give you a place to stay, and there's no money to be had because your face is too well-known for anyone to hire you for a job. Then it's off to the desert and an attempt to brave the wastes and survive! Here's a little random story generator that you can use to come up with the bare bones of a "plot of the night" for a city adventure! Let's put this all together in an example. First roll: 1: An ambitious templar. Third roll: 6: complications ensue when the patron double-crosses the players' characters. Looks pretty straightforward! A templar comes to the party and instructs them to acquire a set of documents for him. (We'll roll randomly to see which group he's working against: 1 = another templar, 2 = nobles, 3 = merchants, 4 = Veiled Alliance. Rolled a 4, so Veiled Alliance.) The templar is trying to get documents about the Veiled Alliance and their business in the city, and he has a lead on a house that is playing host to a suspected member of the Alliance. Given how templars operate -- seeing themselves as the divinely-appointed police force of the city -- the templar will use the stick-and-carrot approach: The templar offers to pay the group if they succeed in the job, but threatens to arrest them if they turn the job down, accusing them of "seditious loyalties to the Veiled Alliance." The templar directs them to a modest house in the craft district of the city, and tells the players to case the place, break in, find documents relating to the Alliance, and bring them back. They have to do it in the next two days or they will be thrown in the pits! The group has some adventures in the house, but then while they are inside the templar raids the location. He has the players' characters seized as collaborators and thrown in prison, and takes the parchments from them -- and with the records, the credit. Now what? The PCs are imprisoned . . . so their next adventure starts when someone offers them a way out . . . Roll: 3 - A member of a loose thieves' association -- probably also in prison -- offers to help the PCs escape, if they . . . roll 3: steal documents again! -- this time the thief wants the PCs to promise to steal and destroy his criminal record -- roll 5: but his information about the situation is incorrect. The thief manages to pick the locks that keep the PCs and the other prisoners shackled at night, and the PCs sneak off to destroy the legal records (for themselves as well as their thief friend! ), but it turns out the papers were recently moved due to a change in the bureau of the templarate, and now there are extra guards on duty and just getting out alive will be a trick! And the adventures go on until the PCs have to "beat the heat" and they flee the city, or they become so influential with one of the power groups that they shift gears from having odd jobs and thief adventures to becoming part of the political status quo and jockeying for position in the courts and arenas of the sorcerer-king. Good luck, city-dwellers! At least you're less likely to be eaten by something . . .